An apartment complex in Alamitos Beach advertises studios and one-bedrooms for rent. Photo by Brian Addison. These are the words from Senay Kenfe, a lifetime Long Beach resident whose mother is one of 9.5 million renters who are legally defined as being burdened by high rents, that is, spending 30 percent or more of their monthly income on rent. More than half of California’s renter population falls into that category. Kenfe has been a vocal supporter of Proposition 10, joining everyone from the left-leaning Los Angeles Times editorial board to the Democratic, Green, and Democratic Socialist parties in supporting the now-defeated state measure that divided tenants and landlords over whether to expand local governments’ ability to implement rent control. While the effect of this type of voter intimidation and extortion can’t be examined through data, it can be connected anecdotally to Prop. 10’s defeat and certainly connected to the No on 10 campaign, which raised and spent some $80 million—over three times the amount raised by its opposition—to create a flurry of television, social media, and radio advertisements that created a David-versus-Goliath campaign. It also created a campaign that was, admittedly, muddled and confusing, those unethical and absurd rent increase threats aside. The No on 10 folks insisted that the proposition would hinder affordable housing, increase rents, and cause an overall upheaval of the housing market—without recognizing that the laws as they exist have, well, hindered affordable housing, increased rents, and caused an overall upheaval of the housing market. Not convinced of that? Here are 10 data-driven charts that break down our crisis. In other words, at-risk renters need an answer—and they need one now, especially given that what we have in place isn’t working. Property owners and realtors, developers and chambers of commerce are quick to come to the defense of their stance. Kristine Noyes is a property owner of a four-unit building in Santa Monica, which has rent control policies. She said the passage of Prop. 10 would not have done anything to address the housing crisis. 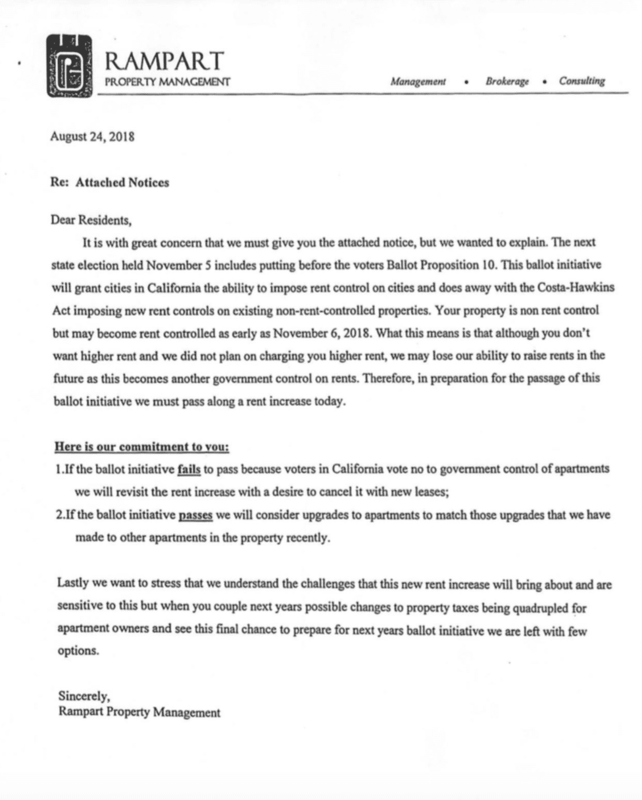 “Rather, it would have removed our incentive to continue being landlords as there would be no upside for us when our long term tenants moved out,” she said. “We would end up [exercising our right in] paying out the long term tenants, and building condos or a single family home that could be sold to high end buyers. That would actually reduce the rental supply in Santa Monica and exacerbate the issue. Whether the response is loquacious or succinct, the overall stance against Prop. 10 is one that has long been backed by economists on both the left and the right: Rent control is bad because it lacks some form of long-term stability (which is an argument, I fully admit, even I mistakenly made). But much like the invalid economics behind the Minimum Wage Increases Are Bad campaigns, the argument that rent stabilization in some form is bad for poor people and the affordable housing stock is also beginning to show its cracks, as pointed out by two different studies from UC Berkeley and USC. The ultimate point is this: For 50 years we have been yelling that rent control does nothing for people, and yet, during that period, the rate of rent-burdened households has skyrocketed. It seems the only ones vehemently against Prop. 10—or, in the least, wanting an authentic, non-self-serving discussion about helping our neighbors and fellow citizens maintain a decent life as a renter—are the ones who don’t have to worry about a roof being over their head. Something isn’t working and it’s affecting not the comfortable, but our most vulnerable. Housing is a right for everyone; displacement should never be an issue for anyone, be they poor or otherwise. This isn’t a matter of money; it’s a matter of dignity and admitting that we’re doing something very, very wrong.